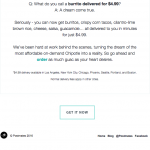 Are you sold on the idea of running cool email campaigns but don’t know where to start? Well, we do. 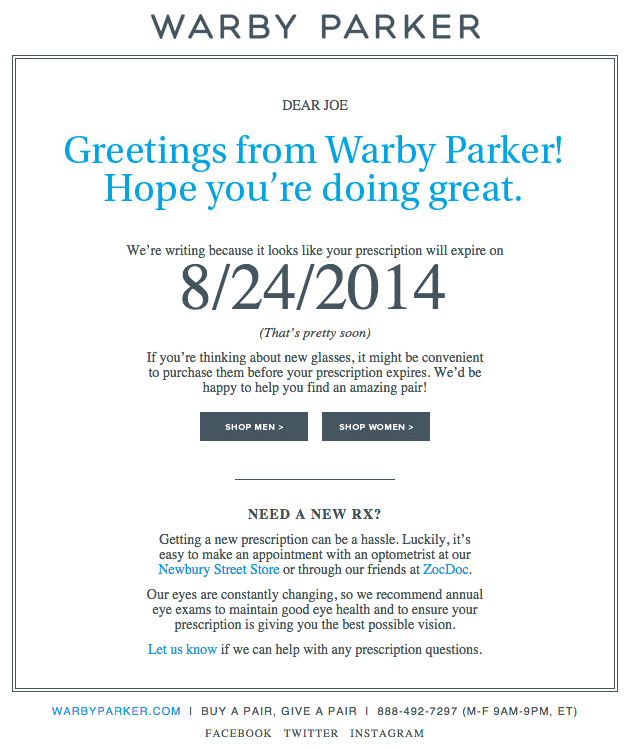 Check out these incredible email campaigns for inspiration. 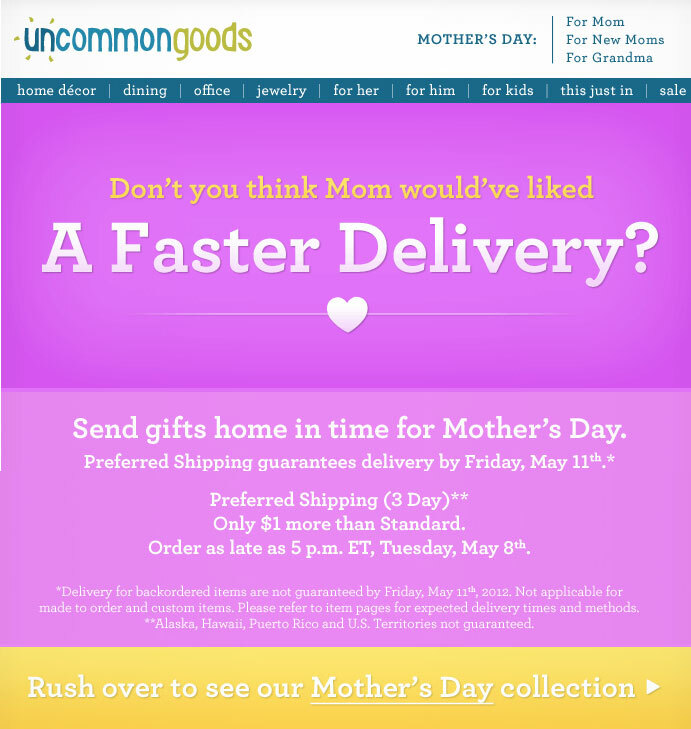 Why It Works: The Uncommon Goods guys have done an awesome job of creating urgency here. 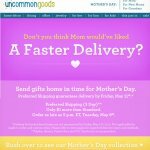 They aren’t just reminding customers that it’s nearly Mother’s Day so they’d better get a gift sorted, they also offer a swift, affordable solution, in clear, concise language… and the delivery pun made us smile, too. 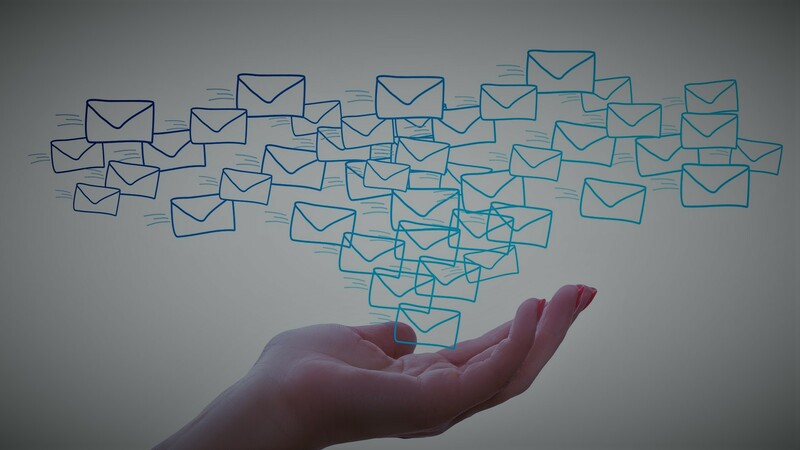 Why It Works: Email marketing campaigns often focus exclusively on getting a person to hand over money and then see that as the end of the conversation. 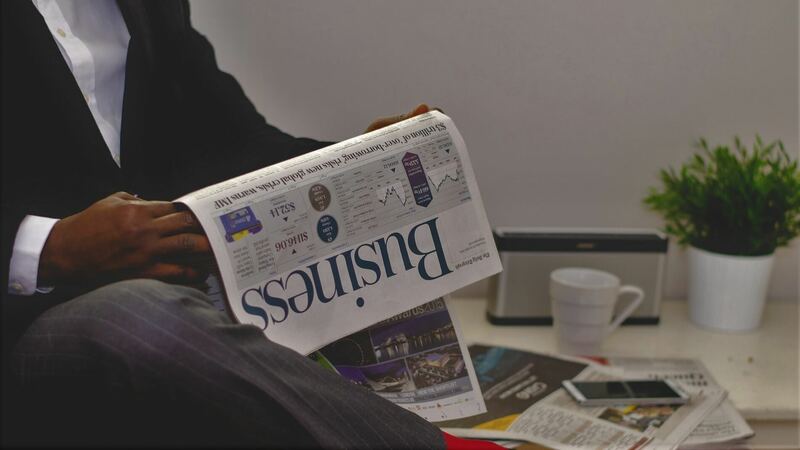 In fact, if you want someone to give you money again in the future, keeping them involved AFTER the payment is an excellent loyalty-building strategy! 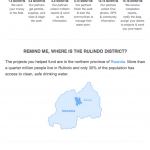 Charity Water is obviously a charity, so they’re also countering popular concerns about what happens to a donation and how it is used, but it’s a great lesson to learn for startups, too. Make people part of your community, not just your customers. 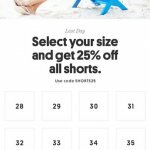 Why It Works: Bonobos takes the urgency idea to a whole new level by making it super-easy to take advantage of their last-day offer. There’s always that frustration when you’re searching end-of-the-sale stuff that nothing you want is left in your size, and normally you might think ‘oh, I don’t have time to scroll through for something I want now’. Bonobos make taking a quick peek extra tempting by letting you jump straight to the stuff that fits – in other words, the stuff that’s directly relevant to you. Why It Works: A well-chosen or created GIF creates loads of visual interest in your emails, and this is particularly effective when it comes to food. 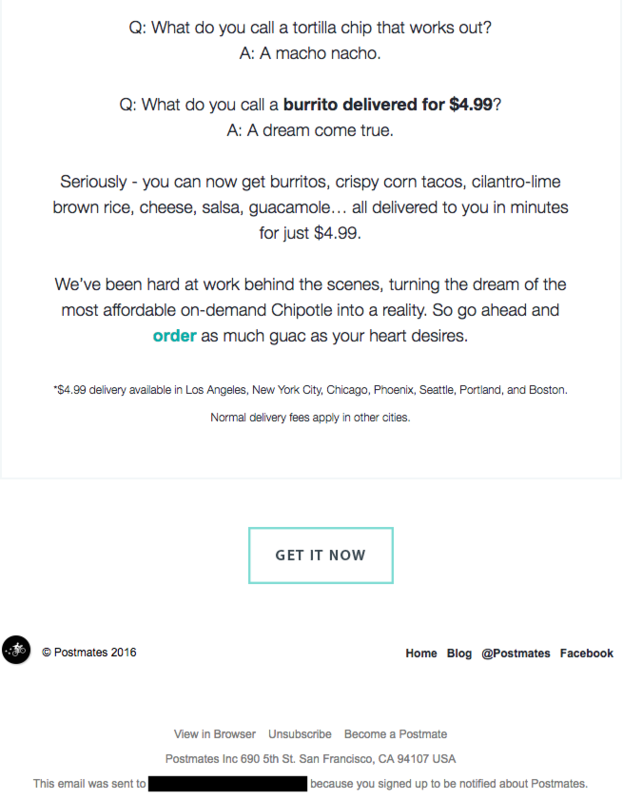 Here, Postmates gets tummies rumbling and then tells them they can have it delivered to their door, right now, for just $4.99. And if that’s not enticing enough, the quirky, minimal copy draws you right in too. Why It Works: Again with the urgency… and in a very useful way, because a lot of people will have completely forgotten when their prescription expires! In other words, the brand reminds the customer that there’s a problem on the horizon but then immediately gives them an easy way to fix it. It makes clicking through very attractive. Why It Works: The thing that is so crafty and brilliant about this campaign is that it offers additional value and ease to existing customers, while at the same time getting them to sign up new people… without framing it as a referral. 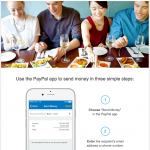 So, PayPal users are encouraged to get their friends to sign up to email so they can pay them with just an email address, but it’s framed as if PayPal is doing them a favour, rather than them getting new customers for PayPal. Smart, huh? Why It Works: Most people sitting at their desks check their email at least every few hours, and at least some of that is procrastination time. So when people are procrastinating at their desks, what are they musing about? Well, a fair amount of the time, it’s what they’ll have for lunch or dinner. 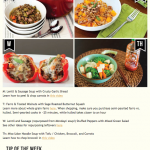 That makes an email like this, that gives you a quick, easy, streamlined way to get meal ideas for the week, particularly compelling to click through! 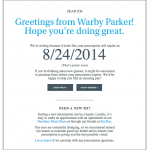 Did you get inspired by our cool selection of email campaigns? Open your free email marketing account today and let the inspiration flow by creating amazing email marketing campaigns that will ‘Wow’ your subscribers.